Few weeks back, we did a post on how the hourly car rental business is making it easier for people to ditch their cars and still retain the convenience of having one when you need it. With all the big players now offering hourly car rentals (similar to Zipcar), more and more vehicles are available in a growing number of neighborhoods. 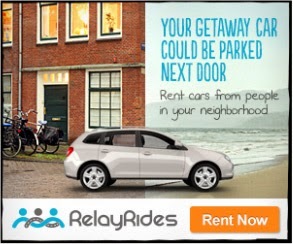 RelayRides connects people looking to rent a car, truck, or SUV with owners willing to rent our their vehicles to make some extra money. RelayRides is available throughout the country, including a few airports, but is not available in New York. Prices vary, largely depending on the make, model and market. Learn more about How RelayRide Works. Booking: With Zipcar, users can see which vehicles are available and for how long. Users can book available vehicles online and that's the end of the booking process. With RelayRides, the process is slightly longer. Renters select one or more vehicles in the desired location and a request with your desired pickup and dropoff time is then sent to the owners. The owner may accept, decline or suggest an alternate time. Once both parties agree, the vehicle is considered booked. Pickup & Return: Zipcars are usually in public parking lots and members can unlock booked vehicles simply by scanning their zipcards. It is quick and convenient. With RelayRides, you're dealing with an individual and not a company and renters are generally required to meet the owner at the pickup time, who then hands over the keys to the renter. The same thing happens when you return the vehicle. Gas: Another notable difference is that with Zipcar, the cost of gas (upto 180 miles) is included in your rental. Another thing of convenience is that if there is more than a quarter tank of gas, you can return the zipcar without filling it up. With RelayRides, you are required to replace the gas you used before you return the vehicle. After the rental is complete, the owner and the renter share their feedback to ensure accountability and transparency. GetAround offers a similar service, although it is available in fewer markets compared to RelayRides. 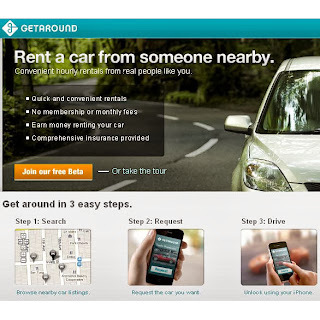 GetAround is currently available only in Austin, Chicago, Portland, San Francisco and and San Diego. Despite its smaller scale, GetAround offers some interesting features that set it apart. Owners who register their vehicles have the option to get the GetAround CarKit installed in their vehicles for free. The CarKit is similar to the technology used by Zipcar in its fleet. It allows for the vehicle to locked and unlocked remotely, tracked via GPS and even immobilized, if required. The CarKit eliminates the need for the renter and owner to meet in order to exchange keys and scores major convenience points from everyone involved. GetAround also offers 24/7 roadside assistance and customer support and a comprehensive insurance that includes liability, collision, property damage, and uninsured motorist protection. Getaround also has a two-way rating system designed to surface community perspectives about the cars available for rent, and the people renting them. Have you rented a vehicle from RelayRides, GetAround or a similar service? Please share your perspective in the comment below.